Gary Tatman builds models cars. 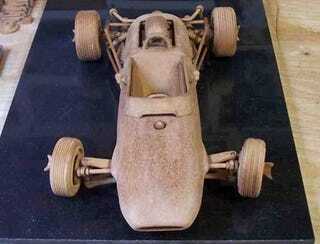 More specifically, he carves replicas of the coolest race cars of all time from simple wood. Dazzlingly accurate models of the Lotus 33b, Porsche 917K, the Ford GT40, and the Tyrrell P-34 below. The hoods of the cars are removable to expose the radiators and vent openings for air flow. The front tires turn in unison, and the Porsche 917k, when complete, will be the first car with steering wheel turning capabilities. I also have a driveline mocked-up that will turn the engine cooling turbine on top of the engine with the turning of the rear wheels as you roll it! All of the shifters, handbrakes and foot pedal assemblies move. The gas caps all lock and unlock, the side view mirrors adjust, and any aero flaps would be adjustable on the car.